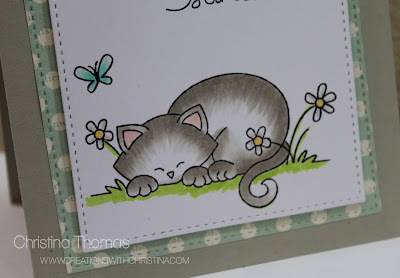 Just popping in to share a card using Newton's Nook Stamps. Every once in a while I like to pull out my Copic markers and practice. 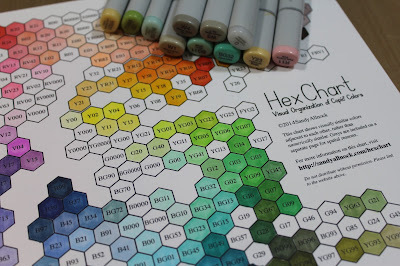 Sandy Allnock's HexChart has been a huge help to me with picking colors and seeing what will blend together nicely. Check out Sandy's You Tube Channel too. She's been a great inspiration to me and makes me want to practice more with Copics and watercoloring. I used Newton's Daydreaming Stamp Set and colored the kitties on some X-Press It Copic quality cardstock with W1-W3 and W4 Copics to get the grayish color. R11 is the purr-fect color for the inside of the ears and nose. For the flowers I used W1 on the petals and the YG03 from the grass to give the stems some color. I also added two butterflies to my little scene. The first one I colored with BG10-BG11 and BG32. The yellow butterfly by the sentiment I colored with Y24 and YR31. Once I was done coloring I die cut the image and some pattern paper with a set of stitched square dies and mounted it on a 4" card base. Disclaimer: I participate in an affilate program with Simon Says Stamps, Scrapbook.com, Cricut.com, Bluemoon Scrapbooking and Amazon. I receive a commission when products are purchased through the links provided at no additional cost to you. What a fabulous card Christina!! 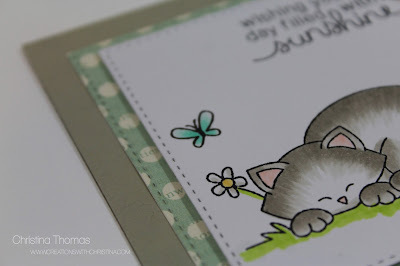 What a darling stamp set and you did a great job with the soft coloring. Thanks for sharing. Now if you will please, send me the card I will be eternally happy! Adorable card and great job coloring! Sandy is a wonderful artist and great teacher; I've learned a lot from her.